The big night is less than a week away, so how do you not have a costume yet?! In my world, Halloween is the night of all nights. It's the only day of the year when it's socially acceptable to dress and walk around like an insane person, eat too much sugar, and scare the hell out of total strangers. What's not to love? I don't know what it is about Halloween costumes that turns even the smartest people into total blockheads, but upon seeing someone in costume, the first thing most of us will utter is "Uh, so what are you?" Here are some inspired last-minute costume ideas that will allow you to answer that question smugly with just a little more pride than usual. For all you content creators out there who feel like you need to bust out of your cocoon, this is the costume for you. It's equal parts cute and witty, and lets everyone know ahead of time that you're going to probably put the whole event on Facebook Live, your Snapchat story, and Instagram. You've probably also started trending a custom hashtag curated specifically around the party theme. At this point, you might as well get ahead of the haters and get one of the Kim K-approved phone cases, perfect for group selfies that demonstrate to your followers just how #blessed you are. This is a little touchy given the current political climate, but if anything can soothe the blow of diplomatic discourse, it's fluffy teddy bears. The right to bear arms, get it? There are two weeks until the election, so this costume is very #relevant—perfect for the friend who loves to loudly voice their political beliefs at the most inappropriate moments (we all have that friend, don't worry). With this costume, feel free to flash your bear-y biceps and offer fans tickets to the "gun show." Attention lazy couples: this is the costume for you! Appropriately punny with very little effort required, this is the perfect ensemble to let everyone know you're totally incapable of being anything other than one half of a couple. This is slightly better than "I'm with stupid," but only slightly. Go on, inspire that jealousy from everyone else—it's very on brand. To be honest, this was my Halloween costume during my freshman year of high school. Damn, I thought I was so original. This is the perfect option for the Criminal Minds fan who loves being clever and a little bit dark all at the same time. Here's hoping this fork in the road might lead to a little spooning down the road with the cutie in the Obama mask, if you know what I mean. This is a great costume for someone who doesn't feel the need to change out of their jeans, but feels the pressure of social obligation to come in costume. All you need is a piece of plastic cutlery and some yellow duck tape to be in business. Now, ease on down the road over to POTUS and make a move! It's going to be super easy for everyone at the party to play Six Degrees of Separation with this costume. We love topical food references, especially when they come as Halloween costumes, but this is one of the best ones we've ever seen. All you need to do is pop a name tag on a bacon shirt. Kevin can wait, but he's also ready to cut loose, footloose, and do the monster mash. Every time you look at photographs from this year's party, you'll definitely laugh at this "costume." Everyone's favorite band to hate can very easily be imitated as the lazy costume everyone's bound to hate on. 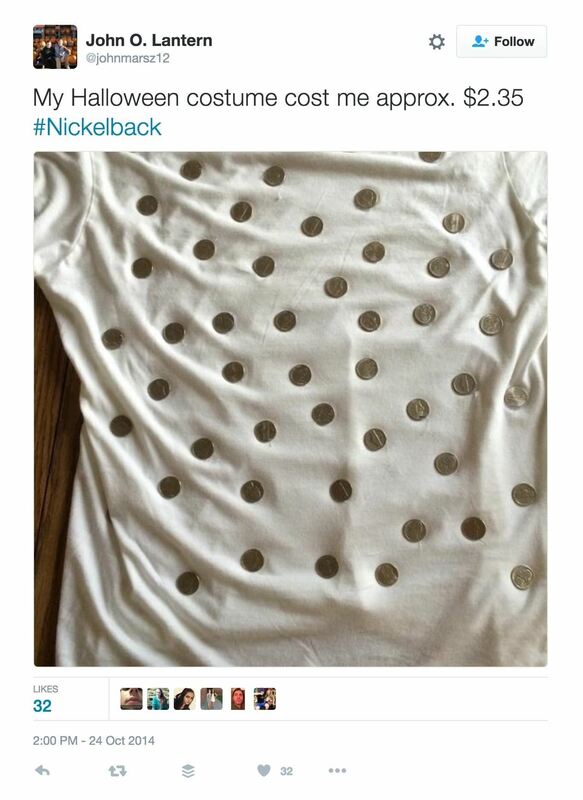 If you insist on wearing your own clothing to a Halloween party, all you need to do is tape or hot glue some nickels onto the back of your shirt and voilà. Let me slip into something more comfortable. This is the perfect costume to show that you were super into your college psychology seminar. Plus, if you want to show a little skin, go right ahead—just don't let your ego get too big, am I right? A beauty but a hungry girl, that Belle. First, let me start by saying that this whole look is simply inspired. This is ideal for your super beautiful friend who consistently crushes a DoubleDilla Combo (#goals) without breaking a sweat or gaining a pound. Better not let her get too hangry though, or she'll turn into a real beast. May the odds be ever in your favor after hitting the pumpkin keg. Cats are a staple at every single Halloween party for a reason: all you need are eyeliner whiskers, ears, and (maybe) a tail. Back in 2012, after the first Hunger Games movie premiered, Katniss Everdeen was that year's hottest costume. It only makes sense that these two seasonal sensations would combine to form the flawless getup for the cathletic gal in your life. A dog's got personality. Personality goes a long way during the Halloween season. You honestly didn't think we'd do a punny costume roundup and not include man's best friend, right? C'mon now. Funny dog costumes are the only things that matters during this spooky holiday season. It'd be hard for humans to nail an impersonation of John Travolta and Samuel L. Jackson well, but these perfect puppers are clearly up for the challenge. Okay, you now officially have no excuse to stay home this weekend. We've given you quite the list from which you can choose your ultimate costume, so go dance the night away! Who knows, maybe you'll find your slutty pumpkin by the bar. These punny costumes will give you an icebreaker—the rest of it is in your hands. 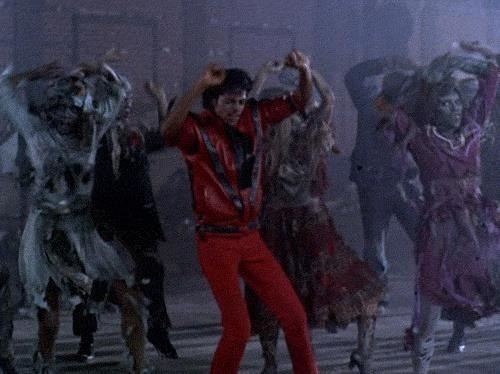 If all else fails, you can always start the Thriller dance.